Camille is a Galactic Agent sent to Demopolis to retrieve an unauthorized alien. While there she comes across Ryder, a half human/half demon, who saves her from being kidnapped by a group of demon teens and then helps her escape during a demon uprising. The story was a little confusing at first and the conversations were a little odd. 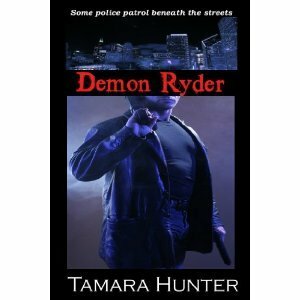 I did chuckle when Ryder mentions Demon uprisings under ground are the cause of Chicago's potholes. Majority of the story takes place over the course of one evening/night, so the relationship is rushed, which is very common in a novella. There just seemed to be something missing between Ryder and Camille and I can not put my finger on it. Something just seemed to be lacking, more with Camille. I wish their attraction to each other had more substance. Ryder realizes he wants more from Camille from the beginning, but Camille never seems to show us more than how physically attractive she finds him. The story explains more towards the end but still leaves you with enough loose ends to set up for the next in the series.